UberMenu includes Font Awesome 5 (since UberMenu version 3.4 – previous versions include Font Awesome 4). UberMenu allows you to choose whether you use Font or SVG icons. By default, it is set to use Font icons. Both SVG icons and font icons have advantages and disadvantages; there is no single best solution for every use case. Font Awesome 5 breaks its icons into 3 sets: Solid, Regular, and Brands. If you leave all 3 settings enabled, a single file will be loaded containing all icons and loader scripts. If you select a subset of the 3 settings, individual parts will be loaded in multiple files – so in that case, we recommend using a plugin like Autoptimize to combine all your scripts & styles to make your site load more efficiently. (You should be using such a plugin regardless for maximum efficiency). If you are loading Font Awesome 5 elsewhere on your site, you can disable UberMenu’s copies of Font Awesome. 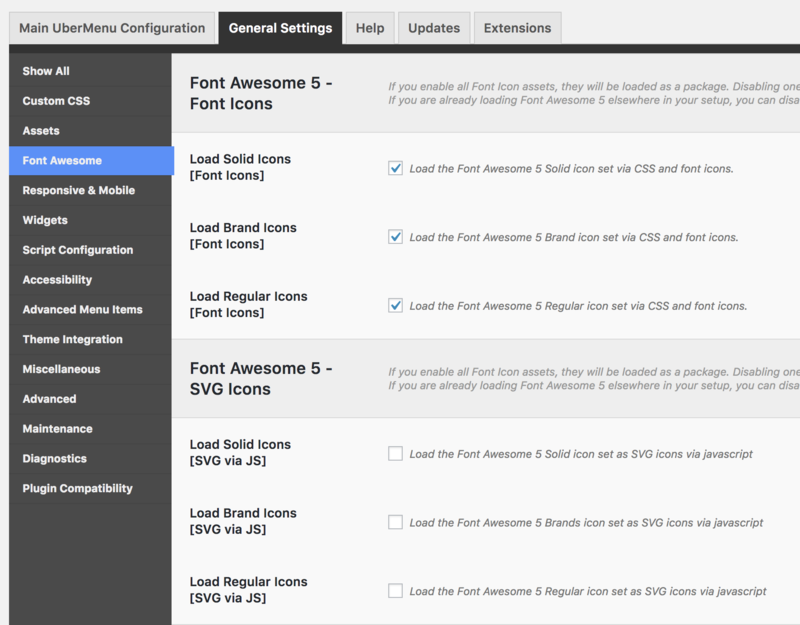 Please note that if you run Font Awesome 4 elsewhere, those resources will not work with Font Awesome 5 icon classes.